If I have learned anything over the past nine years, it’s that every woman’s experience with pregnancy, childbirth, and motherhood is uniquely her own. It is the same with every father’s experience. 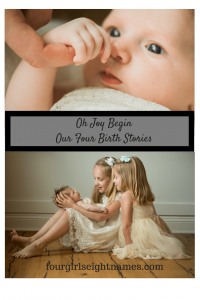 No two birth stories are the same. I woke up particularly early one morning in the middle of the August heat. We had an appointment at 9am, so I just stayed awake, flipping back and forth between the news and Fresh Prince. Nothing seemed different about this day, and after our appointment, it turned out nothing really was different. I was 2cm dilated, still having very regular, uncomfortable contractions, and my blood pressure had started climbing. My obstetrician discussed inducing me that morning, but decided against it because she thought “you’ll do it on your own soon anyway.” I laughed in my head at this point, considering this is what they had been saying for the past 6 weeks. I spent the afternoon at home with my college roommate, who joined The Engineer’s ranks of watching me like a time bomb about to explode. Despite her insistence that we should go to the hospital, I stayed at home, ate dinner with The Eingineer, and watched some of our favorite TV shows. By the time How I Met Your Mother was over, I could tell something was different. After bidding the dog farewell late that evening, we made our way over to Labor and Delivery. One of the blessings (and curses) of working in a major medical center in a very small college town is that you get to know people. Turned out the admitting intern on call that night was a friend from our childbirth class, and his wife was due four weeks after us. Surprisingly, I wasn’t embarrassed, but instead, relieved to see a familiar face. After determining that I was 4 cm dilated and showing me baby’s head pointing straight down on the ultrasound, I was admitted. We met with the anesthesiologist on call about the possibility of an epidural, but decided against it, which in the long run, turned out to be a great decision for this delivery. After laboring through the night, I was 8cm and 100% effaced once the sun came up. I sent The Engineer to get breakfast for himself, and once he finished his biscuits and gravy, the real pain started to kick in. My nurse and the resident never left my side until our sweet girl was born. I could not have asked for better care. 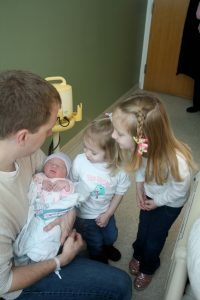 I spent the last hour of labor with my eyes closed; maybe it was my way of focusing, but I think I was just that tired. When I did open my eyes and looked around, there were about 15 people in the room, including an entire pediatric team, the chief resident, the attending physician, and three nurses. I didn’t realize at this point that our girl was so close to being born. But after two more pushes, she entered our world, with the same beautiful, bright eyes that look up at us today. When they handed her to me, I looked around in disbelief. I was half expecting another mother to walk in and take care of her. I’m not quite certain when it clicked for me that there was no one else coming, and that I was the mother I was searching for. I thought once you had a child, you would have the entire childbirth process figured out. Your body would know what to do, and everything would go smoothly. I’m not really sure why I thought this would be the case, but our second daughter’s dramatic arrival into the world certainly proved me wrong! Just like with our first, I started having strong contractions at regular intervals quite a few weeks before she was born. Whenever I described these contractions to my physician, she said they warranted monitoring, since subsequent pregnancies tend to arrive very quickly once they decide to come. On my due date, the contractions got to the point where I was unable to walk around through them, so the triage nurse ordered me to come into the hospital. Luckily, our football team played horribly that day, so The Engineer did not miss a good game while waiting with me to see if our little girl was going to make her debut. I stayed in triage for five hours, where the contractions kept coming. I started dilating further, but then stopped. The attending assured me that I would likely be back in active labor that night or early the next day. As usual, my body had a different plan in mind. The contractions continued until my follow up appointment Monday morning. At this point, my obstetrician looked at me and said “Enough is enough. This baby is so high that you will probably keep contracting with no result until we intervene. Head over to the hospital.” I almost gave her a hug, and after talking with the unit, they told me to come in at noon. We loaded up our toddler and dog to take them to our close friend’s house. Little did we know, they would get to spend lots of time there, as my induction kept getting pushed back, and pushed back, and pushed back again because of the acuity of the patients already admitted on the unit. The emotional roller coaster finally ended on a Tuesday night at 11:30. I had been waiting in labor and delivery for over four hours, when the charge nurse came in to tell me that had enough staff on hand to start my induction. Thankfully, the chief resident who delivered our first baby was on call that evening. She had advocated for me with the charge nurse to make sure there was enough staff present. After determining that this baby’s head was still pointed down (and still quite high), they started Pitocin. Having had a baby without an epidural in the past, I figured I would be in good shape to do the same this time around. However, I couldn’t shake the feeling that something was really different about this pregnancy. I labored through the night, getting up to a very high dose of Pitocin. After having been on the medication for eleven hours, I had only progressed 1 cm. The attending physician was not discouraged, but I certainly was. I wouldn’t wish Pitocin induced contractions on my worst enemy, but here I was looking at many, many more hours of misery. About 45 minutes later, the resident came in and said that the baby’s heart rate was not responding well to the high dose of Pitocin and that they needed to intervene. She recommended oxygen, an epidural and an internal monitor to get a better picture of what was going on. She checked me at this point, and I was 6 cm, so at least I was making some progress. I agreed to the epidural, still not able to shake the feeling that this delivery was going to be much tougher than my first. Right after the epidural was placed, though not yet working, The Engineer arrived back at the hospital from dropping our oldest off with my mother. I was trying to reposition myself in bed between contractions, and my water broke. My nurse went to change the sheets, and she stopped halfway through and yelled out in the hall for the medical team to come in, as our little lady had decided it was time to be born. Within five minutes everyone was in place, I pushed twice, and she was here. The moment she arrived was, quite honestly, the scariest of my life thus far. She arrived very quickly, and as they placed her on my chest, I noticed she was not moving. Nor was she crying, and her color was a strange hue of brownish blue. I bent down to kiss her, only to realize in that completely panicked moment that there was something wrong. The nurse was trying to stimulate her, and I frantically looked up at the physician to ask what was happening. “She just came out too fast, and it will take her a minute to catch up. She’ll be ok.” The nurse continued to stimulate her, but to no avail. I started crying, as my voice crept louder and louder, desperately seeking an answer. They took her over to the warmer, still without a sound or movement, for what felt like an hour. In retrospect, I think it was about one minute, but every second her body was distant to mine felt like an eternity. After some invasive suctioning, she let out a beautiful, robust scream, and everything returned right with our world. It’s just like they say, none of it matters anymore, because she’s here and she’s ours. We wouldn’t have it any other way. If I had to pick my favorite birth story, it would be our third. Maybe it is because it was my shortest pregnancy at 40 weeks and 3 days. And yes, I counted every last second, since I truly do NOT enjoy being pregnant at all. Or maybe it was because I got to reap the benefits of having an epidural for ten whole hours, which felt like a day at the spa. But my money’s on the fact that, the third time around, I felt at peace. Not necessarily about the entire birthing process, but certainly about being her mother. My third trimester, this time around, was boring in comparison to her big sisters’. The doctors and nurses told me to call anytime my contractions got to be 5 minutes apart, and I promptly ignored them. They would have heard from me everyday, and all those theatrics are just annoying. I knew I was risking having her born on the side of the road, but I couldn’t stomach another round of the interns explaining how to count contractions. The big sisters and I managed to get sick on her due date, making everything around our house even more pleasant and joyful. The Engineer left us to fend for ourselves that day for five hours, and I can’t say that I blame him! We sat around pitifully while he ran some last minute errands. Two days after my due date, I reported for my check up, where they discovered that my blood pressure was high and my face was swollen. I didn’t have any other signs of pre-eclampsia, so they sent me home with an induction date that was still three days away and instructions to call if I developed any new symptoms. After being home for about an hour, I was reading to my little ones, and I noticed I couldn’t focus on the page. I also developed a colossal headache and could only sit in the darkness of our basement. Convinced that the nurses would think I was fabricating symptoms (because, let’s be honest, I would think that if I were in their shoes), I delayed calling them, until a good friend convinced me to do otherwise. They sent me over to the hospital without hesitation. I was proud that I had waited until after my due date to land myself in triage this time. My favorite obstetrician admitted me within two hours of our arrival and began the induction. Beginning at only 1cm, I knew we had a decent amount of work to do, but thankfully, my body cooperated. I progressed to 4cm by midnight, and then got an epidural, since they still felt that my chances of a C-section were about 50%, due to my elevated blood pressure. Once the epidural was placed (on the second try, and only after the Engineer almost fainted), my blood pressure dropped quite low, but at least my headache and blurry vision were gone for the first time that day. I never noticed how many food commercials are on TV, especially at night. I was starving all night, but at least couldn’t feel the sting of my Pitocin induced contractions. They broke my water around 4am, and by the time the sun came up, I was 6 cm. 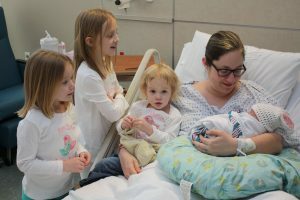 At that point, our sweet girl’s heart rate started to drop with each contraction, and they speculated that her head was compressing the umbilical cord. I got a bunch of fluids, oxygen, and my position flipped every 5 minutes for about an hour while they worked on getting her heart rate up. They also turned off the Pitocin, thinking that the high dose was causing the baby stress. Within a few minutes of the drip being stopped, I knew she were ready to make her debut. The nurse didn’t believe me, citing all the research that shows that it takes “about 2-3 hours for induced deliveries to go through transition“. Not so much for my tired and worn out body. My only “plan” with this birth was for our daughter to arrive healthy and crying. I prayed this my entire pregnancy, since our last delivery resulted in such a stressful moment for my heart. Well, my prayer was heard, as our little lady screamed so loud for the first hour of her life that the nurses aptly named her “that baby with the lungs”. Even as I write this today, I have to chuckle, since her volume control has not changed one bit. It was a joyful beginning. In retrospect, there is a strange peace about the night our last baby was born. I’m not going to lie; it took me some time to reach that peaceful, easy feeling. 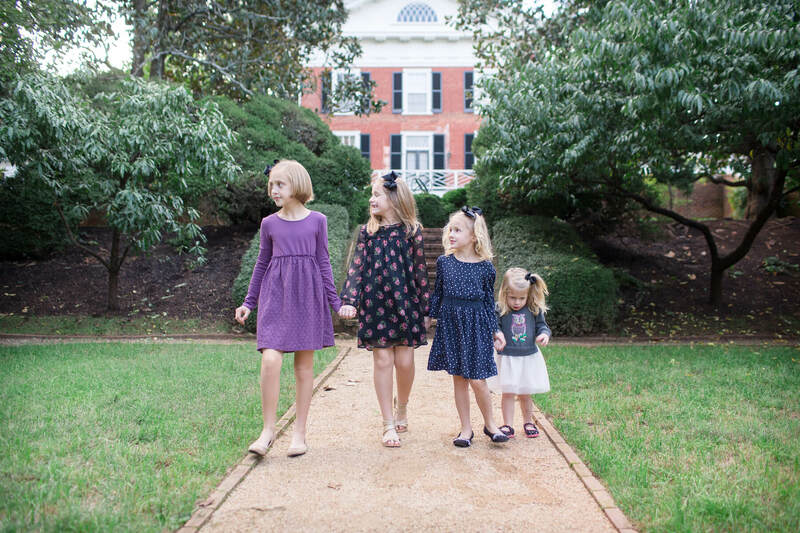 I feel confident that this was the end of us adding to our family, and now we can focus all our love and energy toward raising our tribe of sisters. If I wasn’t sure of this before, I definitely am now. My favorite obstetrician openly offered to induce me during my appointment on her due date. I didn’t have to ask, or beg, or bribe, which was a relief. She said that, since two of my prior pregnancies had to be induced, the likelihood of this baby spontaneously making her arrival was slim. I was cautiously optimistic that my induction would go on as scheduled; The Engineer and I kept having flashbacks to another arrival, which was delayed repeatedly because the hospital was full. Not the case for this sweet girl. 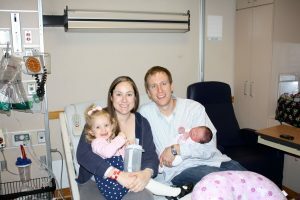 When I arrived at Labor and Delivery, there was only one other mother admitted, and a whole staff of nurses and doctors eager to aid in our baby’s arrival. The morning, and most of the afternoon and evening, was filled with television re-runs, texts from friends, and trying to ignore the fact that I was starving! Cytotec didn’t really do its job, so I was hooked up to Pitocin in the hopes that it would get active labor started. It took four tries and two anesthesiologists to correctly place an epidural, and by 11pm that night, I was finally in active labor. After they broke my water, sweet baby started to go into some distress, and we found that the only position we could tolerate was when I sat directly up in the bed. The baby’s heart rate dropped no matter what side I laid on, and my blood pressure dropped so low at one point that I blacked out for a moment. After that theatrical episode, I started experiencing a great deal of constant, sharp pain near my left hip. This pain wouldn’t come and go, like a typical contraction. The anesthesiologist gave me an extra dose of pain medicine, which didn’t even touch the pain. But, as fate would have it, that didn’t matter. After the bolus of anesthetics, my nurse encouraged me to lie back on my left side. As the nurse and The Engineer were helping me reposition, our last lady made her very rapid arrival. There was no pushing, no warning, no nothing. She quite honestly fell onto the bed, and her father was the only one who saw it! Our nurse scooped her up and placed her on my chest, while simultaneously sending for the slew of other doctors and nurses who needed to be there. It didn’t matter who was there, as this sweet baby cried right away, just to soothe my ramped-up heart. Our physician asked me if the baby was a boy or a girl, and I honestly hadn’t even thought about it until she mentioned it. The Engineer whispered to me, “You were right“, and I knew she was a girl. She was a sweet, precious little girl, to complete our family.